I needed a side dish for my hamburger and had a bag of Yukon Gold potatoes on the counter. 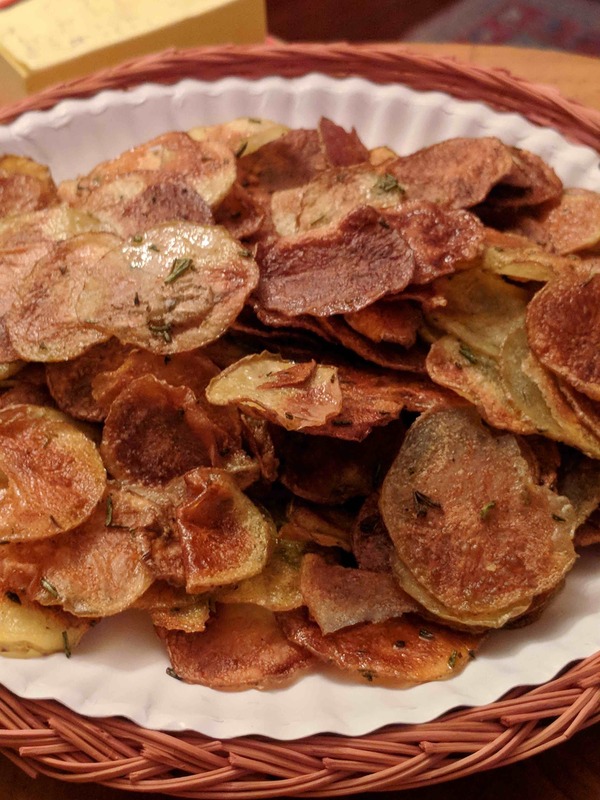 In less than an hour I was able to make some delicious rosemary baked potato chips for dinner. Consider using different seasonings – I also like using Lawry’s Seasoned Salt or Old Bay Seasoning instead of the salt, pepper and garlic. Use a mandolin to slice the potatoes very thinly. Rinse off in cold water and then drain. Stir with a paper towel to separate the slices and to ensure they aren’t too damp for the next step. Mix together the rest of the ingredients in a mixing bowl and then add in the drained potatoes. Toss well, ensuring all the slices are coated with oil and seasonings. Add more olive oil, if necessary. Place on baking sheets in a single layer. Bake for 20 to 30 minutes, switching and rotating sheets every ten minutes. Remove once the chips become crispy. If you didn’t cut them very thin, you might need to flip them over and cook for an additional 15 minutes. Once at desired doneness, transfer to a paper towel covered paper plate to cool slightly. Add more salt or sprinkle with parmesan cheese to kick them up a notch. Makes enough for two hungry people or for four people with mere average appetites for potato chips. Whelp, I seemed to have come down with the cold that has been running amok around here. It means that it is time for some food therapy. 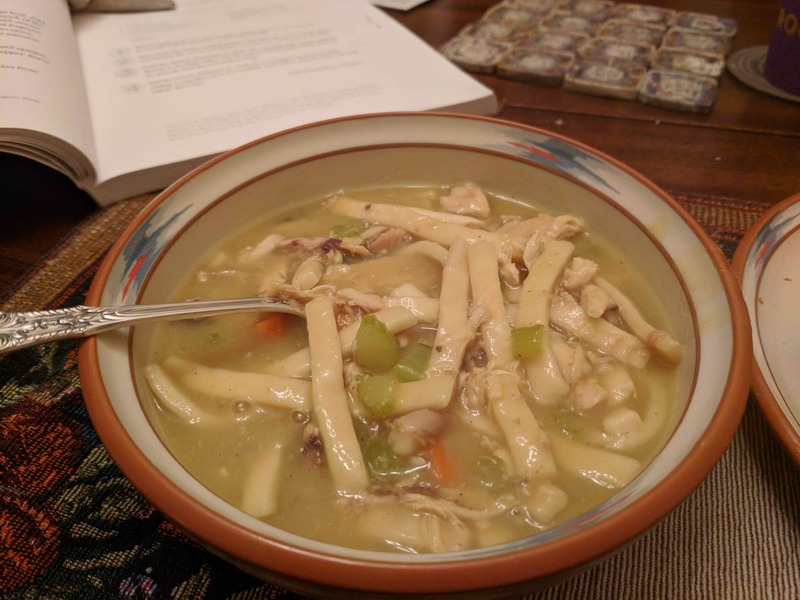 I really like the chicken soup I make with dumplings (see recipe HERE), so I started there when making it chicken noodle soup. I’m still into turmeric, so I added a little of that and the bonus is it makes the soup a beautiful color. Before you say it, I know how easy it is to make egg noodles! I’m sick so cut me a little slack for going for frozen, especially when Reames makes it so easy to just toss ’em in the pot. In a Dutch oven, melt butter and heat oil over medium heat. Add carrot, celery and garlic. Sauté the vegetables until they are soft, a couple of minutes. Stir in the flour to make a roux. Sprinkle in the turmeric. Continue to stir and cook for 5 minutes to remove the starchy taste from the flour. Do not let the roux burn or turn dark brown, lower the heat as necessary. Toss in the bay leaves. Slowly pour in the chicken stock, 1 cup at a time, stirring well after each addition to remove any lumps. Stir in salt and pepper. Bring the sauce to a boil and then let simmer until it is thick enough to coat the back of a spoon, this takes around 30 minutes. Fold the reserved shredded chicken and the egg noodles into the sauce. Bring up to a boil and then turn down the heat. Let simmer gently for 30 more minutes. I’ve already posted the Lemon Blackberry Cheesecake Michelle and I made using a John Besh recipe as our template. Besides wanting to make it truly our own, the big problem was that it just wasn’t blackberry enough. Michelle had the idea of making it more of a structured filling and we figured that double the blackberries meant double the flavor. We were right! Intense fruit flavor balanced with creamy cheesecake. Major yum! Michell made these in three 8×8 pans for easy freezing and transportation. To do so, she had to triple the graham cracker crust but the rest of the recipe is plenty of batter to fill them up. Grease a 9 inch springform pan with 1 tablespoon of the butter. Mix the graham cracker crumbs with the remaining butter in a medium bowl. Press onto the bottom and part way up the sides of the pan. Bake it for 10 or 15 minutes before putting in the filling. In a large bowl, combine the cream cheese with the sugar until smooth. Blend in the milk, then beat in the eggs one at a time, mixing just enough to incorporate. Mix in the sour cream, flour, lemon zest and limoncello until smooth. Divide the mixture between two bowls. In a food processor or blender, puree blackberries with the lemon juice. Mix in sugar and flour. Pulse a few times before adding in egg and vanilla extract. Pour half the cheesecake mixture into prepared pans. Then add the blackberry filling in dollops on top. Pour on remaining cheesecake batter. Place in oven and bake for 2 hours, until the topping is set. Remove from the oven. Raise temperature to 350 and return pan to oven to bake for 20 to 30 minutes or until top is lightly browned. Michelle and I are nearing our anniversary and I wanted to bake her a special treat. 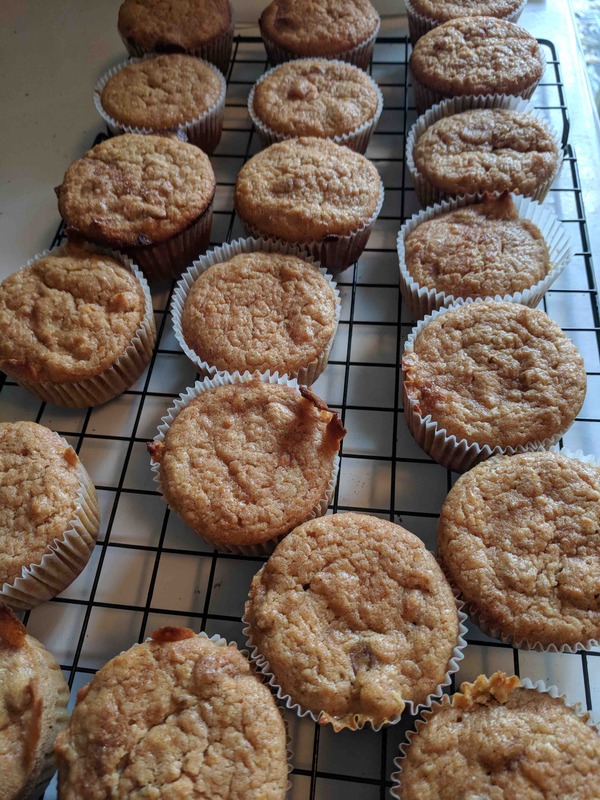 As compromise is the heart of any good relationship, I crafted these muffins that are full of sweet potato and oat bran goodness for her but tasty enough for me. Of course, she is going to experiment with the fat content and even switching to some whole wheat flour but, for me, for now, these are a success – lots of sweet potato flavor but not dense and heavy. This recipe is an amalgamation from one for Sweet Potato Muffins from The Loveless Cafe and one from King Arthur Flour for Oat Bran Muffins. The recipe makes 36 regular sized muffins but don’t be intimidated as they freeze really well. We usually buy lots sweet potatoes when they’re on sale and then bake them all up, scoop out the insides and freeze them in 1 and 2 cup measurements. That makes it easy to pull them out and put them in all kinds of recipes, like this one. You’ll need about 3 sweet potatoes to make 2 cups baked and mashed. Place cupcake liners into the cups of 2 twelve-count muffin pans, set aside. Bring 1/2 cup water to a boil. Mix with the oat bran cereal and let cool slightly. Melt 1/3 cup butter and stir into cereal along with 1 tablespoon honey. Set aside. Cream remaining butter and sugar with an electric mixer. Add eggs one at a time. Scrape down the bowl of the mixer and then add sweet potatoes and beat until blended. Add in the oat bran mixture. In a separate bowl add all dry ingredients, whisking to ensure all the spices and baking powder are well-blended with the flour. Add flour mixture to sweet potato mixture a little at a time until you have a smooth consistency. With a spoon, mix in chopped pecans. Stir the vanilla into the milk. Slowly add milk mixture to the muffin batter, stirring until just blended. Spoon mixture into muffin tin, filling each cup 2/3 of the way full. Sprinkle the top with cinnamon sugar. Bake first pan of muffins for approximately 20-30 minutes, rotating midway through baking. They are done when golden brown and a toothpick placed in the center of the muffin comes out clean. Remove first pan and set the second muffin tin in the oven. Let baked muffins rest in pan for 5 minutes before removing and letting cool completely. Let the muffin tin cool slightly before placing in more liners and refilling the pan as the second one bakes. If you’re ever near Collins, Mississippi at lunchtime consider stopping in at the Main Street Café. It is smack dab between I-49 and US-84 on Main Street (Highway 184) in Collins. 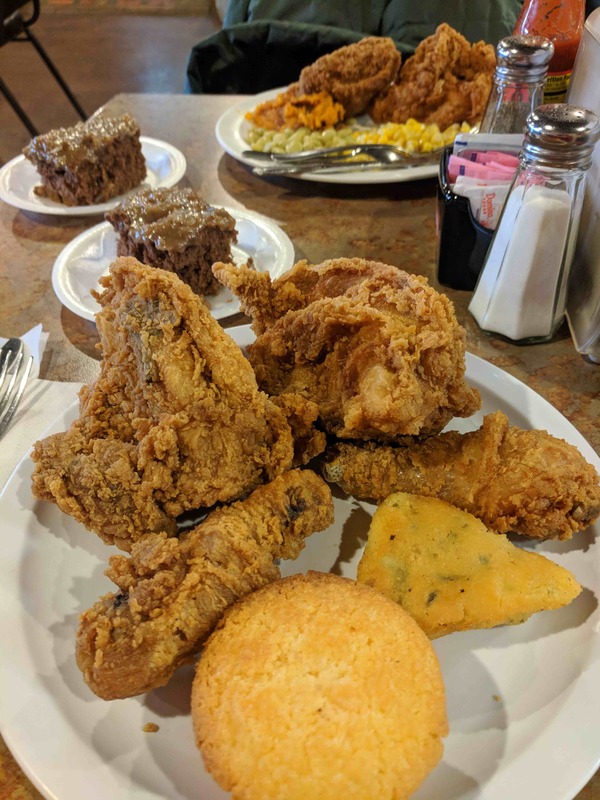 They have an all you can eat buffet for $10 that includes your drink, and a wide selection of down home, Southern classics (a mess of peas, a pot of beans, fried okra, greens, gumbo, cornbread, a large variety of desserts and a salad bar). For the meat selection, they offer ribs, chicken and sometimes catfish. You need to get there by 2pm, though, as they are only open from 9:30am to 2pm on weekdays. As you can see from my plate, I didn’t waste much stomach space on veggies. Their fried chicken is excellent. Very tasty and juicy, with crisp skin and a good seasoning. I got my money’s worth on fried chicken alone! The tea is fresh, the servers are friendly and the food is quite good. I definitely recommend it.